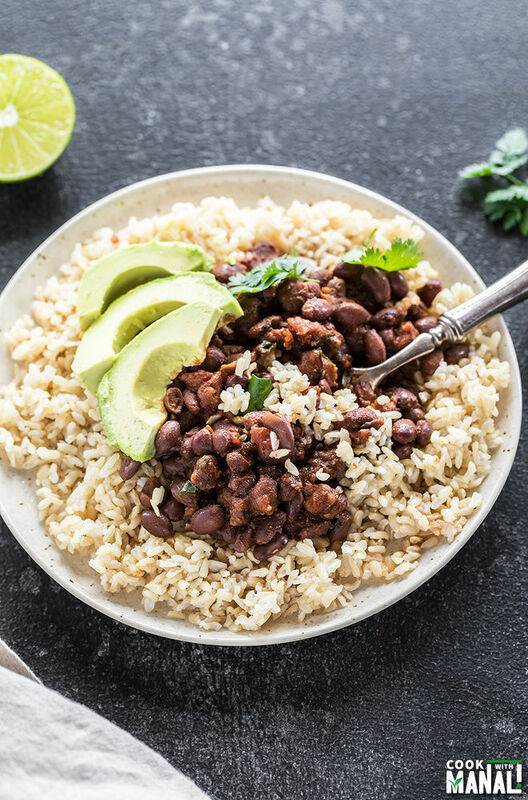 Instant Pot Beans & Brown Rice, an easy & comforting meal made in the IP using the pot-in-pot method. It’s dairy-free, gluten-free and also vegan. Do you guys like brown rice? I didn’t grew up eating brown rice, the only type of rice that was made in my house was white rice, and we pretty much ate that everyday. So it took me some time to get used to the taste and texture of brown rice. But now I really like it, in fact I prefer it so much more than white rice with my stir-fries or even in my chipotle bowl! Sarvesh though is different, he doesn’t like brown rice and has never even tried to like it. For him if its rice, it has to be white basmati rice. Well after coaxing him for years, he has finally agreed to give it a try and so I have been cooking brown rice more often in my kitchen. And guess what I have been using to make it perfect every time? Yep, my trusted Instant Pot! 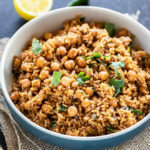 This recipe for Instant Pot Beans & Brown Rice is amazing because it cooks both the beans and the brown rice together at the same time using the pot-in-pot method. 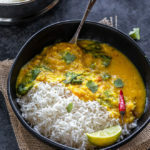 Do you guys remember the pumpkin curry and jasmine rice recipe that I shared? This is pretty similar except that I use brown rice here to make the meal more wholesome. This recipe calls for pot-in-pot method which means that we cook the rice and beans in 2 different containers but at the same time in the IP. So we cook the beans in the inner steel pot of your instant pot and then place a trivet inside and then a container on top of the trivet and cook the brown rice in that container. You can use any container just that it has to fit in your instant pot and it should preferably be made of steel or glass. So what do you need for a Pot-in-Pot method? I have used black beans here which were soaked in warm water for 2 hours. You may soak them overnight, they will be much softer. The beans are flavored with oregano, cumin, smoked paprika and chipotle powder for that spice kick. I served beans and brown rice with some sliced avocados on top. You may also top it with guacamole or your favorite salsa. This makes a great dinner and leftovers are perfect for lunch the next day. Hope you guys enjoy this easy recipe! PS: I will update this post soon with video & step by step pictures, so keep an eye on that! 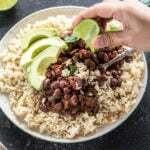 Black Beans & Brown Rice cooked in the Instant Pot using the pot-in-pot method. An easy, wholesome meal which is also vegan and gluten-free. Soak black beans in warm water for 2 hours. After 2 hours, drain the water and set the beans aside. Press the saute button on your Instant Pot. Once it displays hot add oil and then add onion and garlic. Cook for 3 minutes until onions are softened. Stir in the can of tomatoes, add cumin powder, smoked paprika, oregano, 1/4 teaspoon chipotle powder, cayenne pepper (if using). Cook for 3-4 minutes until tomatoes and spices are well cooked. Add soaked beans, water, salt and mix well. Place a trivet inside your IP. Place a container (which would fit into the IP) filled with brown rice on top of the trivet. Add water, oil (optional) to the rice container. Cover the container with lid or aluminium foil. Close the pot with its lid. Press the manual or pressure cook button. Cook on high pressure for 22 minutes, let the pressure release naturally for 10 minutes and then do a quick release. Open the pot carefully, fluff the rice with a fork and remove the rice container. Remove trivet and then press the saute button. Mash some of the beans (optional), add cilantro, simmer for 2-3 minutes. Add remaining 1/4 teaspoon chipotle powder. Adjust spices to taste. Also squeeze in some fresh lime juice. 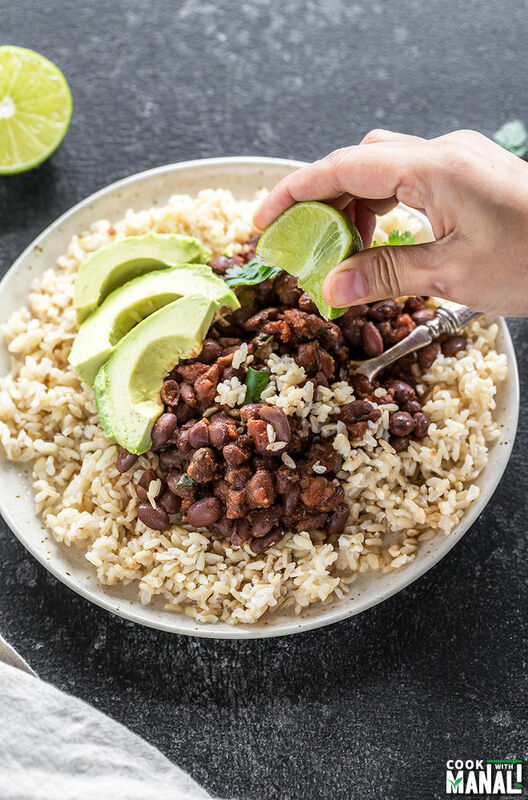 Serve rice and beans with avocado slices. You may add less water to the beans if you like your beans to bit on the dried side. Add 1 cup water in that case in place of 1.5 cups. A very filling and healthy meal! 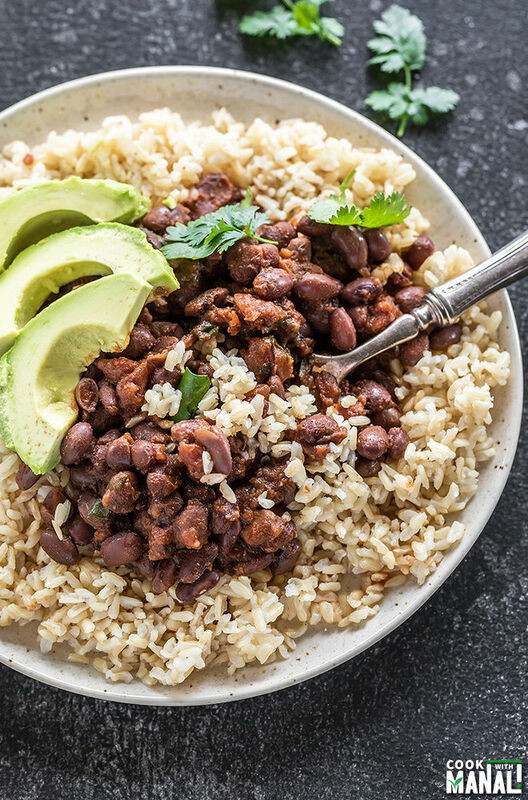 Lovely combo of brown rice and beans. I will try it as soon as possible. Thanks Manali…. Oh gosh, I LOVE these beans ‘n’ rice, Manali! 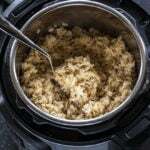 I just got an instant pot a few weeks ago and I’m on the hunt for any and every recipe to make in it! I love how quick and easy this is, yet it doesn’t sacrifice flavor! Perfect for busy weeknight dinners!! Cheers! 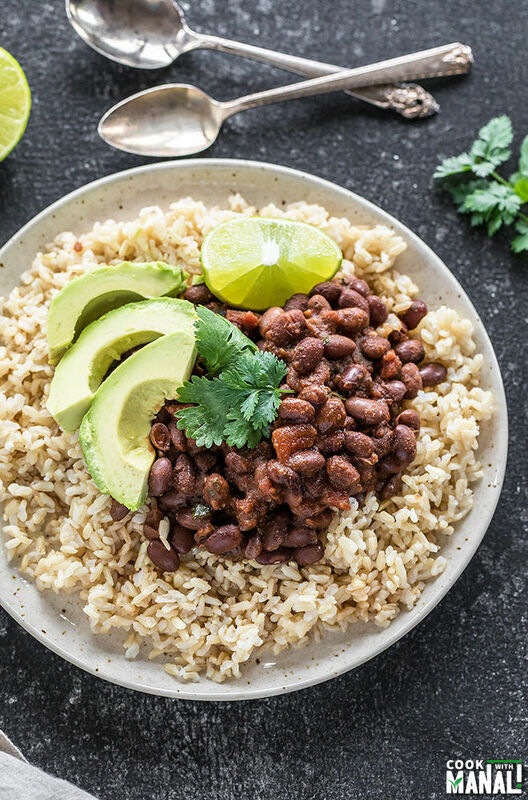 Your post gave me an instant craving for rice and beans. These look delicious. The guac. compliments them perfectly. I am kind of missing all things mexican now! How high should the trivet sit above tje bean mixture? the trivet that comes with the IP works..but I prefer using this trivet – http://amzn.to/2H6hDcp (affiliate). It’s 2-3/4 Inch High! What do you out the rice in ? I am not sure what will fit and what will work without breaking or getting to high. hmm I am not sure if I understood your question perfectly. You mean what did I use to cook the rice? I have given the link to the containers that I used in the blog post. Making this today. Do you drain the diced tomatoes or use the liquid? Ever tried cardamom in your black beans? Love it that way with a bay leaf, a sofrito of green peppers and onions, and a quarter cup of cabernet. Pre-soaking as you recommend is a must, or the broth won’t develop that thick, dark soupiness that is so special about black beans and carries so many flavors so well. you mean green cardamom? Yes in India we use it a lot while cooking our beans, chickpeas! 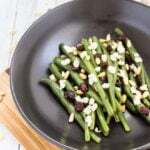 What is the serving size relevant to your nutrition facts? the nutritional information is for 1 serving. I use a plugin which calculates the nutritional info automatically so take it as an estimate only..